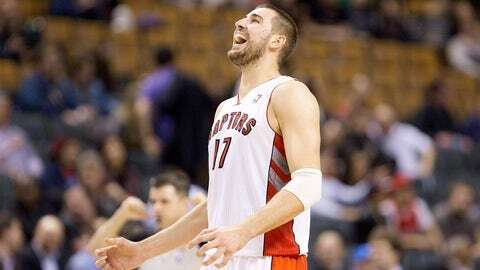 Raptors center Jonas Valanciunas celebrates after getting two points and drawing a foul against the 76ers. Jonas Valanciunas cherished the chance to focus on basketball on Wednesday night. The Raptors center scored a career-high 26 points and grabbed 12 rebounds in Toronto’s 125-114 victory over the Philadelphia 76ers — less than three days after he was charged with drunken driving. "It has been a rough couple of days, but I had to find energy to come out and fight. I felt really good fan support — thank you to them. I felt great, because everybody supported me," said Valanciunas, addressing reporters for the first time since his arrest early Monday morning. "I say sorry, and (am) learning to be better. "It’s been a really good 2 hours (playing)," he added. Kyle Lowry topped Toronto with 29 points in his first game back after missing three with a bruised kneecap. Patrick Patterson finished with 17 in the Raptors’ fourth straight victory and seventh in eight games. DeMar DeRozan added 17 points before leaving the game with a minute to play with a gash over his left eye that required three stitches. The trouble surrounding Valanciunas didn’t affect his game. He scored the Raptors’ first points of the game, then grabbed a rebound on the Sixers’ first shot, and scored on a dunk on a pass from DeRozan on Toronto’s next trip down the floor. "I expected it," Lowry said. "He was going to play like trash or he was going to play amazing. And he played amazing like we expected. "It’s a tough situation for him to handle, but this is our sanctuary, basketball. We get a chance to be away from everything and basketball is our space, our secret spot. 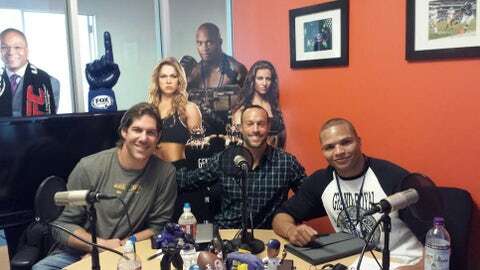 That’s where guys can release a lot of energy and intensity." Henry Sims scored 22 points, Michael Carter-Williams added 19, and Thaddeus Young finished with 16 for the Sixers. The Raptors are headed for the postseason for the first time in six years, and a victory on Friday against the visiting New York Knicks will clinch the Atlantic Division. It will also tie their franchise record for wins of 47 — set in 2000-01 and 2006-07. But the Raptors were coming off a 102-98 win over the last-place Milwaukee Bucks on Saturday, and the Sixers — who recently tied the league record for most consecutive defeats in a single season with 26 — gave Toronto a decent game for much of the night. "These are the dog days, teams that don’t have anything to play for, our guys see the computer, they see the standings and all the records. But we can’t play that way," Raptors coach Dwane Casey said. "I told them we’ve got to pick our defense up and not have the mental letdown." The Raptors led by only a point midway through the third quarter before taking a 98-89 advantage into the fourth. "I think for the most part we went out there and played a solid game, (the Raptors) are a good team," Young said. "They are a playoff contending team, third in the East, they have proven it day in and day out. They have a lot of key guys that can make shots and score the basketball." The Sixers trailed by just six points with 2:44 to play after Young made a 17-foot fadeaway jumper. But Lowry proved once again how valuable he is down the stretch, making consecutive baskets to give the Raptors a 10-point lead with 1:52 to play, and the Sixers never threatened again. "I’m just happy to be back out there with my teammates, honestly," Lowry said. "When you miss games you feel that you are letting the team down and it’s great to be back out there with the fellas." There were questions about Valanciunas playing Wednesday in the wake of his arrest, and Casey was asked about the issue before the game. "We sent a message," Casey replied. "We sent a message that we don’t condone it, we’re disappointed in him. By playing him, we’re not saying we’re condoning it." Valanciunas was arrested early Monday morning in Wasaga Beach, Ontario, and charged with having more than 80 milligrams of alcohol in 100 milliliters of blood. Police say they began investigating after a report that a vehicle went through a drive-thru with open beer bottles visible. DeRozan was pleased Valanciunas "came up big" against the Sixers. "I hope everybody leaves him alone," DeRozan said. "(His game) just shows you he’s not letting everything else affect him, everything that’s going on, or the situation that happened. He’s just going out there playing, he did what he did, it’s over with, he apologized to us, and understands what’s at stake." Valanciunas’s first court appearance is scheduled for Collingwood on April 22. The 21-year-old is not required to attend so a lawyer will stand in for him. He could receive a suspension from the NBA, but that would be pending the results of a trial which would likely be during the offseason. Raptors starting forward Amir Johnson missed his fourth game with an ankle injury. Casey said the hardworking forward, who has long had bad ankles, isn’t 100 percent, but "he’s pretty close." "Probably if he had to go tonight he probably could go, but again, we’re trying to make sure, trying to get him ready for the next couple of weeks," Casey added. The Raptors led for all but a few seconds of the first quarter, and went up by nine points when Lowry converted a three-point play with 23 seconds left. A three-pointer by Elliot Williams cut Toronto’s advantage to 34-28 heading into the second. The Raptors continued to build on their lead, and Patterson’s three-pointer with just under three minutes to go in the second put Toronto up 62-49. The Raptors went into the dressing room at halftime up 68-60. The Sixers opened the third with a 17-10 run, capped by Anderson’s 3-pointer with 6:23 to go that cut the Raptors’ lead to just a point. The Raptors finished the quarter with a run to give themselves a nine-point lead with a quarter to go. NOTES: The Raptors host the New York Knicks on Friday, then play the Pistons in Detroit on Sunday. They host Milwaukee on Monday then play their regular-season finale next Wednesday at Detroit.